After I joined Google as a design intern, I was asked over and over about my experiences at everyone’s dream company. I’ve collected my answers to the most frequently asked questions — including information on my intern project, the training courses and mentoring that I received, how interns are evaluated, and the opportunity to convert to a full-time role. Q: What’s the project that you work on and how it is defined? I was provided with the context of my intern project early, at the same time as my team-matching interview. A candidate can decide whether he or she wants to work for the team based on not only the product but also the project proposed by the intern host. Nonetheless, during the months between the interview and the start date of an internship, the team can change direction potentially leading to changes in the intern project as well. That was the case for me. Although the project I worked on was different from what I was told in the team-matching interview, it was still a valuable experience for me: the project is of the team’s top priorities, and I got to work on it from the initial research to the final usability testing with interactive prototypes. After joining, I was given the flexibility to set up the process and milestones for my project while the problem and the final design deliverables were defined by my intern host. Again, the team’s strategy can also pivot during an internship. Although an intern may lose the opportunity of having an end-to-end project to put in the portfolio, I think it’s a great chance to demonstrate one’s open-mindedness and flexibility when dealing with uncertainty and changes. Q: What are the training resources for UX interns? There are plenty of resources for not only full-time employees but also Google interns to improve themselves. In addition to courses in design skills, there are also courses about soft skills and product strategy. Design courses that I took during the 3 months include UI sketching 101, Sketch intro, Sketch advanced, conversation design, storytelling, inclusive design (designing for accessibility and internationalization), and how to focus users ethically and legally. One advantage of being in the Mountain View office is that I got to take these courses in person. But most of them were available online as well. Out of all the courses, it was especially inspiring for me to learn how Google takes accessibility and internationalization into serious consideration to “design, build, and create for everyone.” It is something that one seldom has the chance to think about without working at a company at this scale. What I really liked about the internship program is that each of us was assigned with a mentor in addition to our intern host. An intern host is usually the one who has the team-matching interview, and the host is also the one that works most closely with the intern and completes the intern’s evaluation. A mentor is someone from another team that has nothing to do with the evaluation. A mentor provides the safe area for the intern to ask any stupid questions they might hesitates to ask in his or her team. Aside from these two, an intern is assigned with a “supportive host” on the same team. In my case, my supportive host was my host’s manager. Both my host and my mentor had weekly 1:1s with me. And I had a bi-weekly 1:1 with my supportive host. They reviewed my design, provided career advice, and connected me with other UXers at Google. It was a priceless experience for me to meet with these senior designers during such an early stage of my career. Q: How is a UX intern evaluated? Can you convert into a full-time designer? Most of my friends and classmates are curious about whether an intern at Google can convert into a full-time role, and the answer is yes. However, on top of being evaluated on their performance during the internship, an intern is still required to go through the on-site interview process if he or she wants to convert to full time. For a UX design intern converting to a full-time interaction designer, the intern needs to do two 45-minute interviews—one with an interaction designer, and the other with a UX researcher. Whether I will receive a return offer or not also depends on four evaluations — one from my intern host, one from my supportive host, and two from the interviewers. While I don’t precisely know how I was evaluated by my intern host and supportive host, I believe it has a lot to do with the OKRs that I set at the beginning of my internship. As a result, it’s critical to spend time and think deeply when setting goals and to review them frequently. Without going back to remind yourself of your goals, it’s easy to forget them as you get busier and busier, and it might be too late to find out you haven’t accomplished everything that you want to when you are filling out the final self-evaluation. 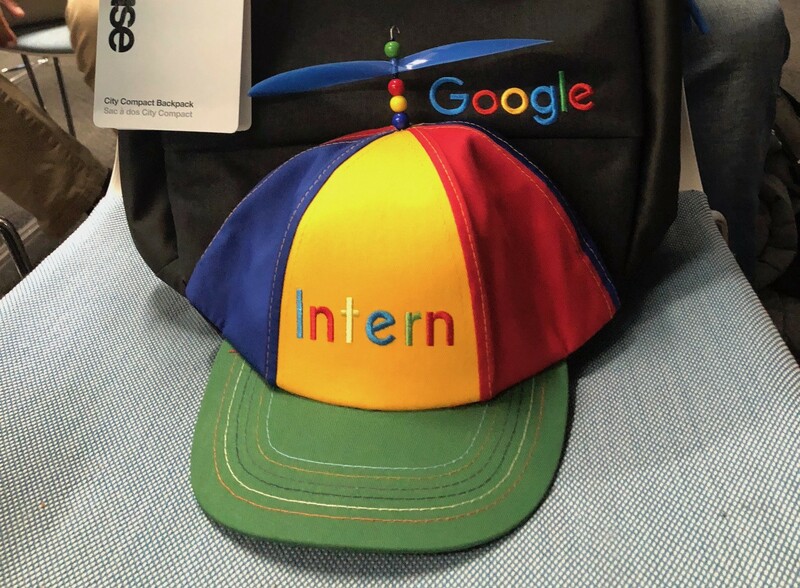 On top of free food, fancy office, and all the perks, why it is awesome to be a UX design intern at Google is that we are encouraged to take advantage of any available resources, to learn what we want to learn and to network with people working in the fields that we are interested in. In addition to the team’s goals or the product’s goals, my personal goals were valued by my host and my manager, and I was encouraged to spend time on things that I cared about.